Aug. 8, 2007 -- The syndicated, worldwide multi-media broadcast of the WoodSongs Old-Time Radio Hour is coming to Arkansas State University in Jonesboro and will give some lucky Arkansas musicians an opportunity to perform for a global audience. ASU will host a taping of the WoodSongs Old-Time Radio Hour on Friday, Oct. 26, at 7:30 p.m. The show’s producers are looking for passionate, talented and unique performers to be featured on the broadcast that will be celebrate Arkansas music and artists. 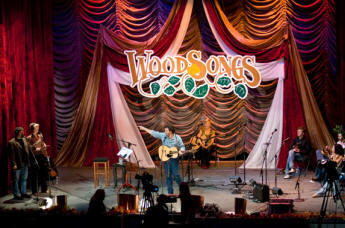 WoodSongs spotlights a wide variety of musical styles including bluegrass, folk, blues, roots and acoustic music. The radio program is heard by over a million listeners each week on 487 radio stations around the world plus XM Satellite Radio, including KASU at Arkansas State University-Jonesboro. A TV version of the program is also broadcast nationwide on PBS-TV affiliates, reaching a potential audience of 39 million viewers. More information regarding WoodSongs is available at www.woodsongs.com. For the taping of WoodSongs at Arkansas State University-Jonesboro, the program will celebrate the diversity and musical heritage of the state of Arkansas. Musicians from across the state are invited to submit applications to be considered to be included as one of the performers on this special program. "I am really excited about bringing the show to Jonesboro," says folksinger Michael Johnathon, the creator and host of WoodSongs, from his farmhouse home in Kentucky. "Every region has its special flavor and passion. I think fans from Australia to Austin to Boston will be fascinated by the depth and talent of the Arkansas artists. WoodSongs is uniquely designed to show that kind of passion to a worldwide audience. I say it every week on the show and we mean it... You don't have to be famous to be on WoodSongs, you just have to be good." To be considered for inclusion on the program, musicians must have a commercially-available CD that can be purchased by the general public. (Independent releases are fine. No home recordings or "demo" CDs.) Applications should include two copies of that CD, a press kit with biographical information about the artist or band, and a brief cover letter. The submissions should be sent to Marty Scarbrough, KASU Program Director, P.O. Box 2160, State University, AR 72467. Applications must be received by Sept. 10 to be considered. For more information regarding the application process, contact Marty Scarbrough at 870-972-2367 or mscarbro@astate.edu. The taping of the WoodSongs Old-Time Radio Hour will take place in Riceland Hall of the Fowler Center, 201 Olympic Drive, on the campus of Arkansas State University-Jonesboro. Riceland Hall is a 975-seat concert hall with a 60-foot stage. The venue is known for its outstanding acoustics and aesthetic beauty. More information regarding the Fowler Center is available at www.fowlercenter.astate.edu. Persons wishing to be audience members for the taping of the WoodSongs broadcast may purchase tickets through the Arkansas State University-Jonesboro Central Box Office at 1-888-ASU-FANS or www.tickets.astate.edu. Tickets go on sale Aug. 15. Families with children are especially encouraged to come. Michael Johnathon usually invites kids 16 years old or younger to sit onstage for the encore portion of the broadcast taping. The WoodSongs Old-Time Radio Hour is broadcast each Sunday at 10:30 AM on KASU, 91.9 FM, the broadcasting service of Arkansas State University. KASU broadcasts to listeners in Northeast Arkansas, Southeast Missouri and West Tennessee. KASU is a National Public Radio member station and an affiliate of American Public Media. KASU broadcasts a wide variety of news and music programs including classical music, jazz, blues, bluegrass, Celtic and folk music. Additional information about KASU is available www.kasu.org.